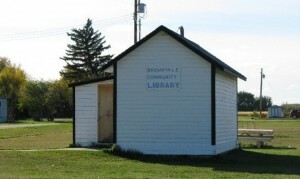 Possibly the smallest library in the world. I grew up in a very small town. 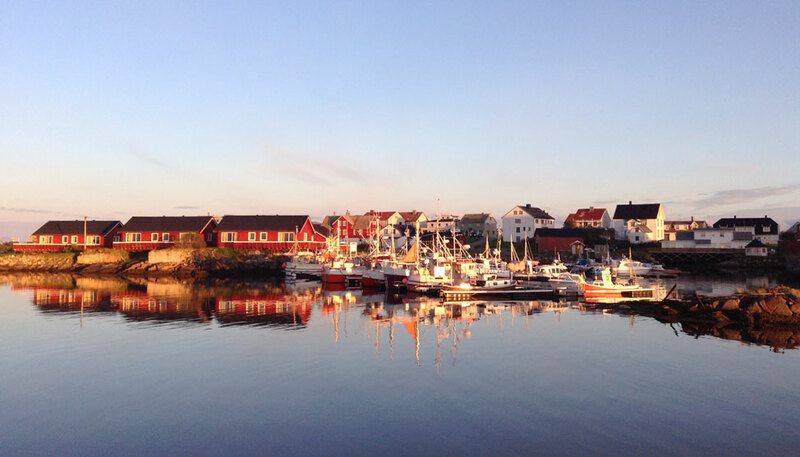 So small, in fact, that it doesn’t even qualify to be called a town – instead it is a hamlet. Two blocks long by two blocks across, I could walk clear across to the other side in less than a minute. Once a thriving farming community, it’s bustle has all but entirely disappeared. When I was growing up there was a school, an active curling rink, a library, a grocery store and a hotel. These are now all closed and some torn down. Urged on by our parents, my sisters and I all moved away for school and better jobs. It was never an option to stay there. We, in essence, did a small part in contributing to it’s demise. Such is the way of many small North American towns, losing their support and commerce to the box stores being put in the bigger centers down the road. Gone with the commerce are the jobs, gone with the jobs is the draw for young families to reside and keep it alive. My hometown may one day entirely disappear. With this in mind, one of the things that Pete and I love most about Ireland is the vitality of its smaller centers. Scattered along the interior twisty roads there are plenty of them, some no bigger then where I grew up, but with a lot of life, charm and manicured beauty. Thanks to the government’s “Tidy Town” initiative, where communities are annually judged on their aesthetic, each municipality shines. Buckets of blooming flowers are everywhere, fresh paint spruces up old buildings, the grass is always neatly trimmed. And they all seem so lively – every one of them has a pub (of course), at least a small grocery store and various other commercial entities. There is just one after another. We’ve driven around plenty in our exploration of the local country side, and marvel at how each looks as good as the last. For us, the bright colors, well preserved architecture and the appearance of a vibrant community is somewhat surprising and very intriguing. In discovering throughout our travels that we are more happily country mice rather than city mice, this whole area holds a lot of appeal. But, how long will it last? With a hurting economy and the scarcity of jobs, will their small towns suffer a similar fate? I always take note of the kids wandering through the streets, kicking at rocks and hanging around outside of the grocery store, or absentmindedly batting around a soccer ball in the park. I wonder what their dreams are, where their future lies, and if they are as eager to get out of their small town as I was. Whether they know it or not, the fate of this intriguing part of the Irish landscape rests with them. Peaks and sea - the best of both worlds. 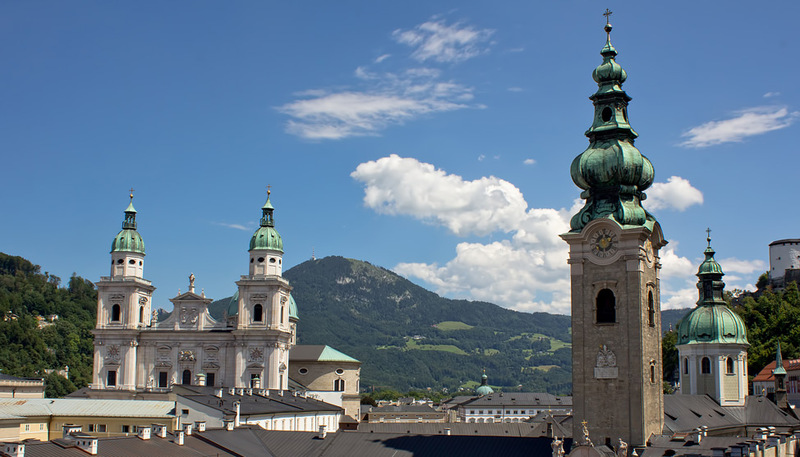 Our first stop in Austria, the picturesque town of Salzburg. The town you grew up in sounds like my hometown. Small little town with one or two main stores and one stop light. Parents told all their kids to move and get better jobs not it seems as if no one is there at all. Great to hear that small towns are thriving elsewhere but like you mentioned how long will it last. I actually talked to a small business owner yesterday who said that small towns here are actually growing – because the roads have been improved, more people are moving out of Dublin and just commuting. I still find it hard to believe that this will be sustainable though, with the cost of gas forever on the rise, etc. Yes, sad that small towns in US are becoming extinct. I love visiting small towns–in US and other countries. If they are not covered by any guidebook, then they are my type of place. Because I do not want to go on a trip and see more people like me. Charles McCool recently posted..Travel Tip: Where Do You Want To Go? Totally agree Charles – we tend to shy away from the big cities and stick to the rural areas. And it’s turning out really well for us this time…we love it here. I have to admit I love small towns as well. I have a love/hate relationship with big cities. I love to explore but the people can be overwhelming. I guess that is why I prefer mountains over beaches as well. Small towns are quaint, quiet, and fun to explore. It probably helps that I am from the South. 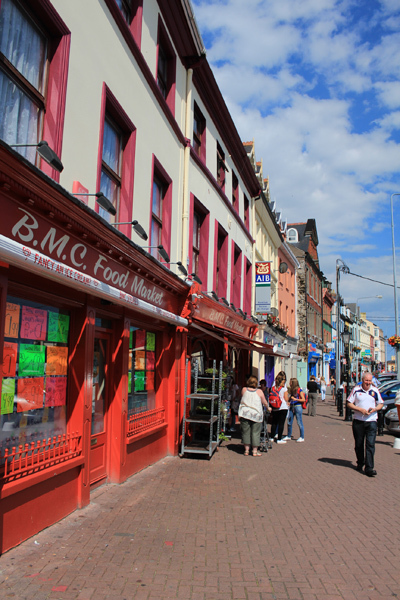 Exploring towns in Ireland sounds like a fantastic way to travel! Jeremy Branham recently posted..Where in the world am I? 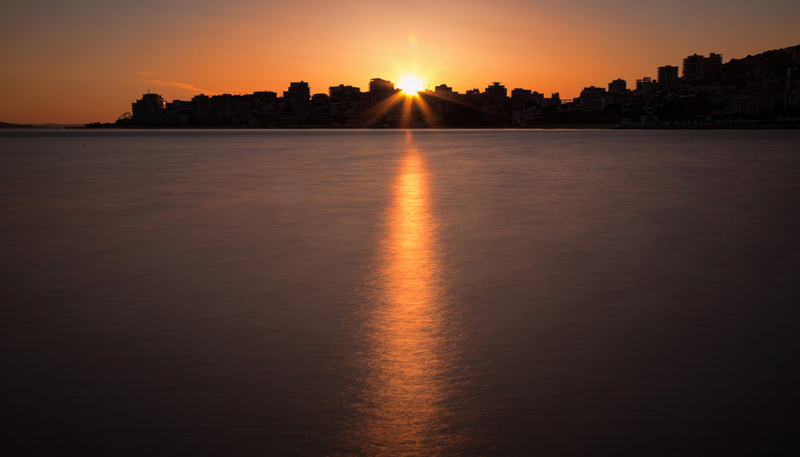 There are some big cities that we love (hello, Buenos Aires!) but we typically always find ourselves rushing for the exit after a few days. Love the tranquility of small towns, the hospitality of the people, etc. And we find we are mountain people too! Used to think we’d love the beach life, but after 6 months in Honduras, we realize that is not for us. I’ve always thought that if and when the time comes for Jeremy and I to settle in any one place (I mean, it’s got to happen sometime, right? Eventually we’ll be in our 90’s! ), it would be somewhere with a “village” feel. I’ve yet to find that in the US (that also has everything else on my “must have” list) but I agree that some of the countries in Europe (especially Ireland!) actually offer such places. I hope they stick around until my 90th B-day! Haha, me too Maureen! Because that is exactly the kind of place we want to settle in too…whenever that settling time may be! You are both so lucky to see these small towns while they exist,Lloyd and I are off to the British Isles including North and South Ireland and hope we get a chance to adventure out like you both are doing.I just hope 2 months is enough.Thanks for all the pictures and hints on travelling,greatly appreciated. I grew up in a pretty small town myself, but not that small. It wasn’t until I went to Ireland that I feel like I appreciated small towns more. There was just something about them; whether it was their charm or the locals and their Irish stories. It made me really fall in love with the small cities of Ireland and really embrace getting outside of Ireland’s bigger cities. I will be very interested to see how the rural life here compares with other countries in Europe. Will they carry the same charm or are they dying off as well? That’s about how many people were in our town – 100, maybe, if you include pets! I was talking to a small business owner and she said the small towns are actually growing right now – we’ll see if that continues. I love the chance to see “small-town” life in Ireland. One of the great things about getting off of the interstates in the south is the chance to visit small towns which are either thriving or dying. That library held a LOT of books, surprisingly, it was a big part of my childhood. When I was in high school I actually came home one day to see a group of tourists having their picture taken outseide of it! I laughed so hard. I see it happening on the East Coast of Canada, right now Nova Scotia is bidding on a ships contract against BC and Quebec and if we win it a lot of towns that were dying would be saved. So sad that the fate of those small towns rests on one contract. And what happens when the contract is completed? And what happens to the small towns in BC and Quebec if they don’t get it? Sad, although I know how much they need stuff like that on the east coast. We are traveling back to my small town in Iowa in about a week for my parents anniversary. At 7,000 people, it’s one of the largest towns in SW Iowa. It’s hard to believe I was on a Mediterranean cruise ship that housed more than half that amount. I think most people leave small towns because, like me, they can’t envision themselves living in a town where you know everyone or they are in careers that don’t exist in small towns. It’s fun to visit unfamiliar small towns, but for now, I think I still like the convenience of living in a larger city. A beach does, usually, help everything! 🙂 Like you said, hated it growing up, but now the feel of it is so appealing. If/when we ever settle down again, I’m sure it will be in a smaller place. We wondered exactly the same thing…how long can they last? It is a bit of a sad and scary thought for Ireland because small-town life seems to really be a part of the culture for many people. I don’t know how they keep the small businesses there going and what people do for work. A lot of people can commute to the big cities now that the roads are improved (said one small business owner I talked to). The small towns are actually growing right now. Who knows if this can really last though? Dalene, this is something I wonder about ALL the time because I grew up in a similarly small town…1200 people, if that. I had no choice but to leave to continue my education. In my opinion, a part of Newfoundland heritage is dying with the demise of these towns…they’re such a significant part of our history, yet we can’t keep them alive. And yet there’s something alluring about small town life, especially the intimacy of it all…and the quiet. Love Ireland’s initiative to do something about it! It’s such a sad thing to see all these places dying off across the country. Someone tweeted to me that it’s because of Walmart, and in a way, I think she’s right. It’s killing small businesses that are the lifeblood of these tiny communities. I definitely could not wait to get out of my small town while growing up. Now as an adult, I fully appreciate its charms, its people, and its part in my growing up! Crazy right…if we only knew then what we know now! I feel exactly the same way. Pete was a city boy growing up but feels the same draw to them now as I do. The village you picture seems in the middle of a gentrified renewal. Our challenge in the UK is often preserving pretty villagers for permanent residents rather than transforming them into second homes. Are these second homes or only homes, do you know? Theodora recently posted..Welcome to Singapore! My guess is that those were only homes, as they were in an offbeat town that doesn’t get many tourists at all. 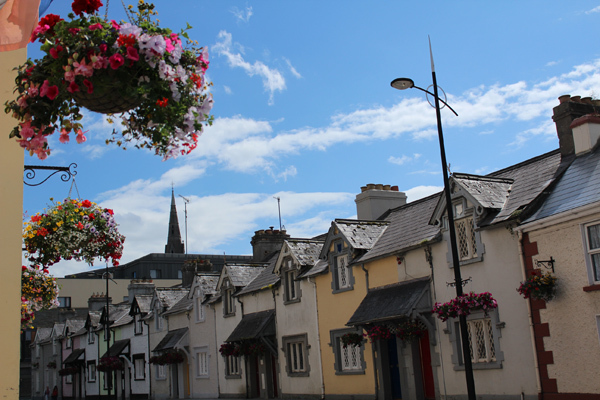 The small towns around Ireland all look like that, their “Tidy Town” program the government runs sure seems to keep them all interested in beautifying the towns. I also grew up in a small town with a population of about 1300 on a good day. I loved it; it gave me opportunities to learn and do things city kids could only imagine, like driving by myself in the 5th grade. I wouldn’t want to live in a place that small again, too many people in each others’ business. But I do enjoy spending time in small towns, and it makes me sad to see a once thriving place blowing away like my hometown is. I know that feeling, having been in the “hamlet”! I think since I’ve left home (17 years ago?) I have met one person who knew the place where I grew up! You guys are the lucky ones. I was born and raised in large towns, and the smallest town I have been in was basically the outskirts of Vegas. Hopefully, I’ll get to live in a small town like the one I’m making up in my book that will hopefully will be a big time seller. Keeping small towns and local businesses thriving makes for such a supportive community, but it is definitely understandable if you have to shy away from it for school. You make an awesome point about Ireland’s small towns though. Thank you for sharing this!